As students walk the halls this week, they noticed something new on their way to the F and D-wing. The subtle change might even have escaped the eye of students in a hurry to get to class. But the impact this change will bring to the amount of plastic water bottles used will not go unnoticed. 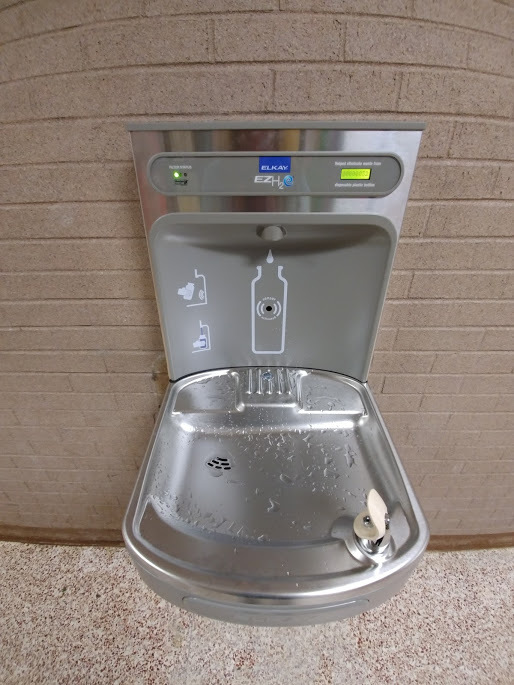 On Monday after school a new, state of the art, water fountain with a built in bottle filler was installed in the F-wing hallway. “We have been wanting to pilot one on of these fountains for a while. The fountain in F-wing (fountain) started leaking and needed to be replaced so we found this to be the time and location for this pilot program,” Director of Operations Ronald Rhodes said. This new machine has a different design from the older fountains. The new feature allows for easy bottle fill-ups by using sensors to tell when a bottle is in position to be filled with cold, filtered water. It even has a tally marker to show how many bottles of water are dispensed. This is also a reflection of the plastic that is being kept out of the garbage. If this first fountain operates well there will hopefully be more to come. “If this pilot goes well we will be adding others,” Rhodes said. In the meantime students and staff will get use to the new fountain available to them.